STEMI Care In India & The Real World: Challenges Ahead. A scenario not infrequently encountered in our practice is given below. A 45-year-old normotensive and non-diabetic male shopkeeper had chest and upper abdominal pain beginning early in the morning. The pain initially was intermittent and temporarily subsided. Our patient attributed the discomfort to upper gastro-intestinal discomfort and he had some home available remedies for gastric discomfort. Four hours later, after reaching his workplace, the pain returned in a severe form and associated with vomiting. He reached out to the local general practitioner, who evaluated him and administered injectable ranitidine and antiemetics. There was temporary improvement and he went back to his office. He applied for leave and reached home. On the way home, he had an episode of fainting and was rushed to the hospital in the nearby town which was 40 km away. He was admitted and evaluated to have extensive ST Elevation anterior wall myocardial infarction (STEMI) with qRBBB. He was thrombolysed with streptokinase with a window period of 14 hours. He seemed to be stable. Later in the night, the patient developed acute pulmonary edema and required intravenous diuretics, nitroglycerine and morphine. Next day morning the patient was referred to a PCI capable centre, which was 50 km away. He underwent an angiogram that showed an occluded proximal left anterior descending artery and an ejection fraction of 20-25%. He underwent rescue PCI and stenting to proximal LAD with non medicated stent. The procedure was complicated by no flow and hypotension, for which adjunctive pharmacotherapy along with intra-aortic balloon pump were used. He remained in CCU for 7 days and was later discharged with an ejection fraction of 20-25%. The patient was discharged on multiple medications. One month after his acute MI, the patient continued to have class III dyspnea with exertion and was unable to return to work. A follow-up echocardiogram demonstrated impaired left ventricular systolic function (EF 25%) with severe apical hypokinesis. He was advised an implantable cardiac defibrillator, which he could not afford. The above scenario is fairly frequently seen by Indian cardiologists even in 2015. The case brings out glaring deficiencies at various levels in STEMI care in India. Individually, we have excellent hospitals, physicians, clinical cardiologists, and cardiac interventionists. Of late we are having good ambulance services, at least in some states. 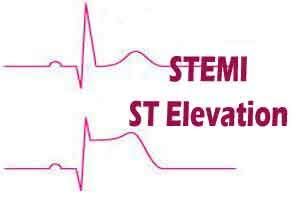 However, we do not have ANY system in place for STEMI care across the country. The world-over dedicated STEMI programs are successfully implemented in many Western countries for nearly three decades. This commentary focuses on the possible systems that may be put in place to improve the acute care of STEMI across India. Most of the improvement in outcomes in Indian patients could be achieved by timely implementation of the proven therapies focusing the time window. Indian ACS patients, for reasons not exactly clear, seem to present with higher percentage of STEMI. They are less likely to receive timely reperfusion therapy, invasive therapy and evidence based medicines 1-3. The above patient scenario brings forth a few major lacunae in STEMI care that include lack of dedicated STEMI care systems, lack of instantaneously available ECG facility at first point of medical contact, lack of patient awareness, lack of physician readiness, lack of equipped ambulance systems network for patient transport (Emergency Cardiac Services : ECS) and pay from pocket for even Emergency Medical Services (EMS). These are the major reasons for the excess mortality and poorer outcomes seen in Indian patients with STEMI3. In the Italian Registry of TNK in STEMI of 27,000 patients6. It has been shown the thrombolysis with TNK is easily n, accessible, and available everywhere. Door to balloon time in PPCI exceeds 90 minutes practically. Then, PPCI does not reduce mortality consistently. Rapid diagnosis and early reperfusion are pillars of success in STEMI Care. TNK is Class 1A recommendation for STEMI ACCP Guideline7 and is recommended in Pre- Hospital Thrombolysis Protocol (Vienna STEMI Registry8 The Mayo Clinic STEMI Protocol9 and The French FAST-MI registry10). The potential of TNK cannot be overemphasized. It is given a bolus dose with no hypertension, no allergic reactions, longer half life, high fibrin specificity and simplified weight adjusted dose, with mostly very minor manageable bleeding. It is an agent of first choice for pre-hospital thrombolysis in STEMI. It has been shown in one of the study that only 4% of transferred patients received PPCI within 90 Min.11 Pre-hospital thrombolysis is the strongest independent predictor of in-hospital survivor in UK12. In the recently published Indian registry on STEMI consisting of 15,222 patients 722 centres treated with indigenous tenecteplase (TNK) has shown clinically successful thrombolysis in 96.5% of patients in less than three hours, 96% in three to six hours and 85.3% in more than six hours of STEMI13. Pharmaco invasive therapy including early administration of thrombolysis (TNK) followed by PCI within 3-24 hours after initiation of thrombolytic therapy regardless of success of thrombolysis. However in case of thrombolytic failure, a rescue PCI should be instantaneously performed. Timely guided protocol for early thrombolysis with tenecteplase (Grade IA) at the level of physician, non-PCI capable centres/nursing homes with intensive care facility and subsequent access to PCI capable centres improves STEMI outcome14. Such a strategy may be the preferred strategy in India as PPCI possible only in 10% of STEMI patients14. There are significant barriers to effective STEMI care. They are at public awareness level, patient level, hospital/physician level and at Government and societal levels. Patients often ignore symptoms, self medicate and even when they decide to seek medical attention, they consult non-physicians in India. To overcome these barriers, organized patient education and awareness programs are urgently needed. Cardiological society of India (CSI), Association of physicians of India (API) and the Indian medical association (IMA) should join hands in these awareness programs. Such programs should not only use the traditional methods like public lectures, print materials, but should also focus on television, internet and social media. The public should be educated that for anyone beyond their teens, an ECG is a must for acute pain or discomfort from jaw to umbilicus including upper limbs. Public should be educated about the significance of time, seeking immediate medical attention and timely reaching the ‘right’ hospital or physician for STEMI care. Another most important barrier is at the level of hospital systems. For a country like India, wherein only less than 10% of STEMI patients receive PCI, primary PCI cannot and will not be the answer for every patient of STEMI. We should rely on thrombolysis, especially bolus agents like Tenecteplase (TNK), and promptly shifting the patients to a PCI capable centre. Considering the efficacy, a strategy of prehospital thrombolysis should be ideally suited for Indian conditions. Considering the diverse Indian conditions, a combination of strategies could be more appropriate. For instance, primary PCI should be the preferred strategy in most of the hospitals, who are already offering 24 x 7 emergency PCI services and the patient can reach the available STEMI Care PPCI capable centres less than 90 min15. In case there is a delay in access to PPCI capable centre due to lack of transfer facility, densely populated cities, traffic congestions etc. Other cities and small district towns would have certified STEMI care physicians and hospitals. These hospitals should do the initial care, thrombolysis with TNK, management of complications and then should have an organized way of early transfer to nearby cities wherein early angiogram and PCI are possible. For rest of rural India, pre-hospital thrombolysis with TNK could be the ideal strategy. For these to become practical, we need to have “Integrated STEMI Care Systems”. We need to have emergency (108) ambulances, equipped with a facility to do an ECG and transmit to a central station, wherein a cardiologist can ascertain STEMI. Upon confirmation of STEMI, the patient should receive aspirin and statin. These ambulances should also have medical and paramedical personnel who can assess sickness, administer a questionnaire to assess the suitability for thrombolysis with TNK. The patient should be taken in the ambulance that has facility to monitor rhythm and defibrillator. Automated algorithms can decide, based on the place, distance to a STEMI hospital or a PCI capable centre, whether to shift for primary PCI or to a hospital for thrombolysis or pre-hospital thrombolysis in the ambulance itself. Accordingly the hospital should be activated and no time should be wasted at the hospital emergency. If pre-hospital thrombolysis is decided, the patient or relative may talk to a centrally stationed cardiologist and the medical personnel get a consent and administer the agent under cardiac monitoring inside the ambulance, while the patient is being shifted to a nearby hospital. Therefore, Golden time window intervention of < 2 hours is most powerful predictor of salvaging jeopardized myocardium in STEMI and significantly reduce STEMI inflicted morbidity and mortality. If TNK is given in <60 minutes, it may reduce infarct size from larger to smaller, transmural to subendocardial or may even abort MI, thus help improving subsequent PCI outcome by reducing thrombus burden and better TIMI flow. Time delay > 90 minutes reduce the benefit of PPCI. Thus the objective of Integrated TIMI Care is to minimize time from chest discomfort to ECG < 30 minutes ((FMC), ECG to drug intervention <60 minutes, drug intervention to PCI < 90-120 minutes will definitely have STEMI inflicted morbidity and mortality benefit in our country to create global impact. We must act locally to impact globally. Chopra KL, Chopra HK, Aggarwal KK. Et al. IV stk in AMI. 6-36 months follow up HK Chopra, Indian Heart Journal, Indian Heart J. 1990 Jan-Feb;42(1):13-25. Xavier D, Pais P, Devereaux PJ, Xie C, Prabhakaran D, Reddy KS, Gupta R, Joshi P, Kerkar P, Thanikachalam S, Haridas KK, Jaison TM, Naik S, Maity AK, Yusuf S; CREATE registry investigators. Treatment and outcomes of acute coronary syndromes in India (CREATE): a prospective analysis of registry data, Lancet. 2008 Apr 26;371(9622):1435-42. Nallamothu B, Fox KA, Kennelly BM, Van de Werf F, Gore JM, StegPG, Granger CB, Dabbous OH, Kline-Rogers E, Eagle KA; GRACE Investigators. Relationship of treatment delays and mortality in patients undergoing fibrinolysis and primary percutaneous coronary intervention.The Global Registry of Acute Coronary Events. Heart. 2007;93:1552–1555. Mehta Sameer. et al STEMI Interventions – Future Perspectives, Excerpt from: Chapter 19, Cath Lab Digest. Volume 16 – Issue 2- February, 2008. Melandri et al Italy Review of tenecteplase (TNKase) in the treatment of acute myocardial infarction Vascular Health and Risk Management 2009:5 249–256. Jack Hirsh, MD, FCCP, Chair; Gordon Guyatt, MD, FCCP; Gregory W. Albers, MD; Robert Harrington, MD, FCCP; Holger J. Schünemann, MD, PhD, FCCP Antithrombotic and Thrombolytic Therapy*: American College of Chest Physicians Evidence-Based Clinical Practice Guidelines (8th Edition), 2008;133(6_suppl):110S-112. Kalla K1, Christ G, Karnik R, Malzer R, Norman G, Prachar H, Schreiber W, Unger G, Glogar HD, Kaff A, Laggner AN, Maurer G, Mlczoch J, Slany J, Weber HS, Huber K; Vienna STEMI Registry Group.Implementation of guidelines improves the standard of care: the Viennese registry on reperfusion strategies in ST-elevation myocardial infarction (Vienna STEMI registry). 2006 May 23;113(20):2398-405. Epub 2006 May 15. Cambou JP1, Simon T, Mulak G, Bataille V, Danchin N.The French registry of Acute ST elevation or non-ST-elevation Myocardial Infarction (FAST-MI): study design and baseline characteristics. Arch Mal Coeur Vaiss. 2007 Jun-Jul;100(6-7):524-34. Nallamothu BK, Bates ER, Herrin J, Wang Y, Bradley EH, Krumholz HM. Times to treatment in transfer patients undergoing primary percutaneous coronary intervention in the United States: National Registry of Myocardial Infarction (NRMI)-3/4 analysis. Circulation. 2005; 111:761–767. 7. Jollis JG, Roettig. Gale CP, Manda SOM, Batin PD, Weston CF, Birkhead JS, Hall AS. Predictors of in-hospital mortality for patients admitted with ST-elevation myocardial infarction: a real-world study using the Myocardial Infarction National Audit Project (MINAP) database. Heart. 2008;94:1407–1412. Iyengar SS, Nair T, Hiremath JS, Jadhav U, Katyal VK, Kumbla D, I. Sathyamurthy, R.K. Jain, M. Srinivasan et al. Pharmacologic reperfusion therapy with indigenous tenecteplase in 15,222 patients with ST elevation myocardial infarction – the Indian Registry. Indian Heart J. 2013 Jul-Aug;65(4):436-41. JJ Dalal,T Alexander,V.Dayasagar, S.S. Yengar, P.G. Kerkar, A. Mullasari, SP Sathe, G.S. Wander et al. 2013 Consensus Statement for Early Reperfusion and Pharmaco-Invasive approach in patients presenting with Chest pain Diagnosed as STEMI (ST Elevation Myocardial Infarction) in an Indian Setting JAPI.Vol 62.June 2014. Mehta Sameer, Oliveros E, Reynbakh O, Kostela J, Ossa MM, Zhang T, Botelho R, Rodriguez D, Botero M, Thomas J, Para D et al Thrombolytic Therapy in STEMI Interventions, CSI Cardiology Update 2014.